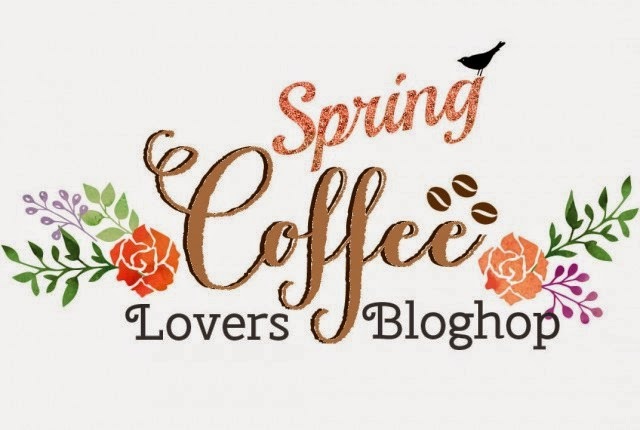 It's time for the Spring Coffee Lover's Blog Hop! Amy Tsuruta and Chaitali Narla are the co-host for this event and the co-hosts of the Coffee Loving Cardmaker's Blog. The hop starts there. I used the Hero Arts Need Caffeine stamp set for my distressed cups and the steam is from Lawn Fawn's Love You a Latte. I used some springtime colours for my mugs, I think we all need this as we are hopefully sending winter packing. My blue panel is a happy accident. I knew I wanted coloured cardstock to back my cups and I pulled this piece out of my scrap bin. I previously cut a wave from it but I actually liked the way it looked so I left it alone. I love everything about this!!!!! Love this card Tracey!!! And hooray for happy accidents! And for coffee! I love these cups stacked... and i agree that the wavy blue panel is perfect! 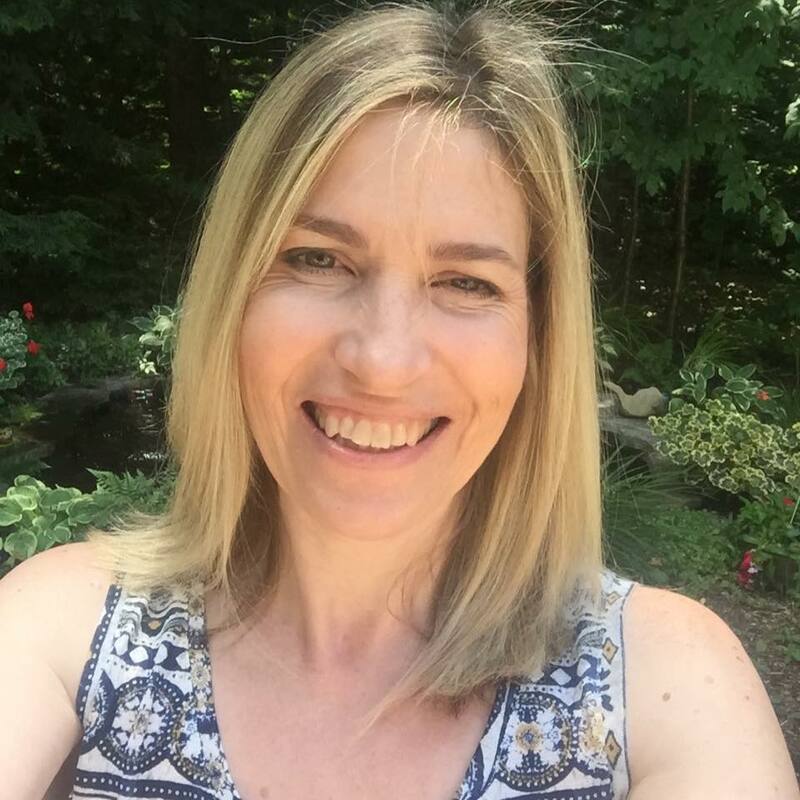 LOVE these bright colors, Tracey! Great use of your scrap piece too! So SWEET, Tracey! Love the colorful cups! Cute! Love the stacked cards! The blue matches the coffee cup. 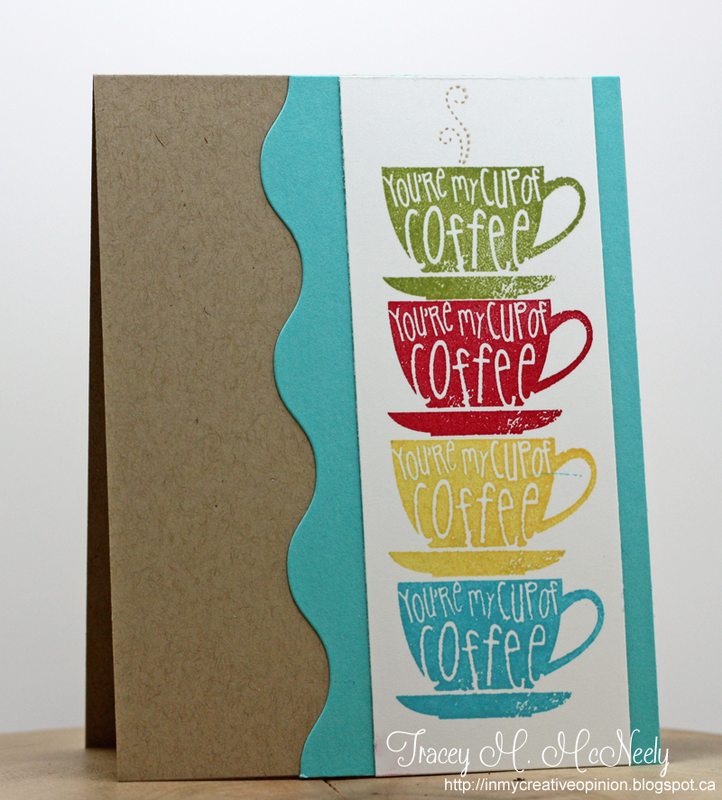 such a bright and colorful coffee card! Absolutely FUN with all of those colors!! Love it! Gorgeous card! Love the coffee cup stamp! Tracey, love the happy accident...it makes those fun coffee cups pop! Perfect card Tracey!! This is so cute!! Love the bright colorful card you have created! Wonderful card, and love the turquoise panel against the kraft paper. love the stacked cups all in my favorite colors! awesome! I have this set too- but wouldn't have thought of this- looks awesome! Love the stacked cups and gorgeous colors...great design! love the cups stacked and inked in different colors! So pretty - I love the colors! love the wavy blue panel. I would have put it to the right but I like how you did it. It really compliments your colorful stack of cups. Absolute great all those colored cups love that stampset. Very cute card! Fresh and colorful! I LOVE your stacks of cups!! I love the colors and layout you used too! Love your stack, Tracey, love the rick rac border as well! Happy Friday and have fun hopping! Great CAS card - that wavy border is fun and I really like the stacked cups! Looks like a 4 cup day! Tracey....Love your card and the colors are so fun! Want to come to your house for coffee! I love your wonderful stack of colored cups! I like your stack of colorful cups!! Love your stack of cups!!! Great colors too! Thanks for sharing your wonderful card. Love the colors. Superb with the bright colors and Kraft!!!!! What a fabulous spring-themed coffee card! Gorgeous colours for your stacked cups and the wavy cardstock: perfect! I love happy accidents! It really adds a lot of interest to those sweet cups of joe!! Love this card, Tracey. That cup is a fantastic stamp, and I love how you have stacked everything. Such a charming design, Tracey! I love the wavy border and how you stacked your coffee cups! Beautiful colors, too! Fabulous! Love all your bright colors and your fun mistake is perfect! Very cool. Love the colors you used. Well done. Wonderful! I love the colorful cups like candy, and that wavy border looks so mod with the clean graphic images! I love your design. Great card! 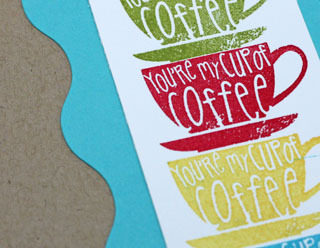 I'm loving the boldness of your card with all the cups a different color! Cute! The little touches are often what makes a card really shine and the little touch on this one is that cute little steam image. And the wave strip is perfect; don't you love it when something just falls into place. Awesome, love the bright stacked cups. Well this card really stacks up against the crowd (hehe). Isn't it nice when a happy accident of a scrap turns out to be the perfect thing?! Awesome work! Your happy accident is so perfect, love this fabulous design. I think its interesting, unique and kinda a great idea to have NOT colored in the birds on your Retro card. I'll have to tuck that idea away in the creative side of my brain. ALL of your cards are wonderful - how gifted you are. Fun card, Tracey! Love the bright spring colors and great design! love the stacked colored cups and that wavy edge my friend! Super card Tracey, love the stacking and the huge big wavey wave!! fabby! Great colors, love your stacked coffee cups! I love this stacked mug idea and must try it--I really like that blue wavy paper. Tracey, fun. Love your colorful stacked cups and the curved border. Sweet card and I love all the stamped cups in different colors! I have not seen this coffee stamp set before, love it! You card is beautiful! I like the wave and the stack of colorful cups. Love the wave with the stacked cups in all the colors. Really cheery card!! I love your stack of cups! So cute! This is such a cheerful card - I love it! I love this fun design! Very cute and I love the colors!